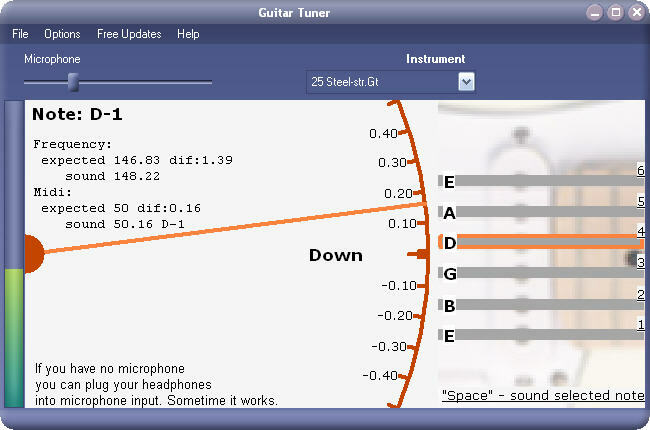 Xitona Guitar Tuner 1.1.0.0 Free Download - Acoustic guitar strings tuning. High precession note pitch measuring. Acoustic guitar strings tuning. High precession note pitch measuring. This simple software determining exactly pitch of your guitar strings, by using microphone and sound card. You can try it free of charge even without microphone. If you think you can tune your guitar exactly using only reference tones, you are poorly wrong. Theoretically, when you are using reference tones and the frequencies are roughly the same, a great resonance is produced. In this case reference tone become a source of forced oscillation, which cause strings oscillation on the same frequency. And it sounds like guitar is tuned. But actually own string frequency can greatly differ from reference tone. That's why preferably to use passive system which only listen and does not provide any sound oscillations. Statement: First, please download the orginal installation package by clicking the download link. Of course you may also download it from the publisher's website. Using Xitona Guitar Tuner crack, key, patch, serial number, registration code, keygen is illegal. The download file hosted at publisher website. We do not provide any download link points to Rapidshare, Hotfile, Depositfiles, Mediafire, Filefactory, etc. or obtained from file sharing programs such as Limewire, Kazaa, Imesh, Ares, BearShare, BitTorrent, WinMX etc. Software piracy is theft. If you like Xitona Guitar Tuner please buy it.